The Astronaut’s GIANT STEP will be released January 25th, and will include the Climax Heroes Fourze theme song “Endless Play” on the CD’s b-side (wow, they seem to neglect the b-side nowadays). We first heard the song in (somewhat ironically) the last episode of Kamen Rider OOO, and note that it was also the last song recorded by Maki Ohguro before taking a temporary leave of absence from singing. The Single, originally slated for release on October 21st, will be released on December 7th. Fourze Theme Song “Switch On!” CM: Party like a rock star, style like a Greeed. The single comes out November 23rd. Available as either a CD+DVD version, or as a CD-Only version. Author M.F. 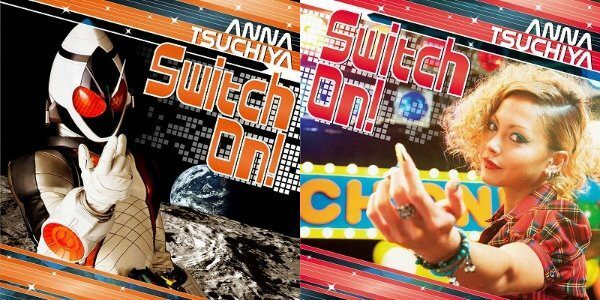 CalhounPosted on November 2, 2011 Categories MC's postsTags Anna Tsuchiya, commercial, Kamen Rider Fourze, release date, single, SWITCH ON!, theme songLeave a comment on Fourze Theme Song “Switch On!” CM: Party like a rock star, style like a Greeed. The Fourze side is rather cool looking, the side with Tsuchiya on it, not feeling it as much. A little too 80’s bubblegum pop for me. Either way, not a half bad cover. And you can see this cover in real life (hopefully with a CD inside) when the single debuts on November 23rd. That’s 1200 yen for CD-Only version and 1800 yen for CD+DVD, which includes the music video. Fourze theme song single “Switch On!” release delayed: How am I suppose to wait til November to hear the full song?!! Bad news for anyone waiting for the release of the single “Switch On!”, a.k.a. the theme song to Fourze by Anna Tsuchiya. It looks like release date has been pushed back by Avex Sound to November 23rd from October 26th. No word on why the date has changed. The single will still be available at the originally stated prices of 1890 yen for CD+DVD edition and 1260 yen for CD-only. Author M.F. CalhounPosted on October 2, 2011 October 2, 2011 Categories MC's postsTags Anna Tsuchiya, delay, Kamen Rider Fourze, release date, single, SWITCH ON!, theme songLeave a comment on Fourze theme song single “Switch On!” release delayed: How am I suppose to wait til November to hear the full song?!! Maki Ohguro to release “Anything Goes! Ballad” this October. In what may be one of the last stories to come out about Kamen Rider OOO for a long time, it appears that Kamen Rider OOO’ theme song, “Anything Goes!” by Maki Ohguro, has sold over 80,000 copies, making it the largest sale made in the history of Kamen Rider theme song! Well, it looks that success won’t end yet, because Maki Ohguro, who recently recorded the finale song for Kamen Rider OOO, entitled “Anything Goes! Ballad”,has announced the release of said song as a single! The song, which will be played during the final fight scene in OOO, will be the final version of the theme song to be played with a full orchestra. And this song was the final song Ohguro recorded before taking her leave from singing (I don’t follow celebrity news enough to know if this leave is temporary or permanent). Will be released October 19th in both CD and CD+DVD editions, costing 1200 and 1800 yen, respectively. This will be released just two days before the release of the OOO Den-O All Rider: Let’s Go Kamen Rider! OST is scheduled to be released, which features the TaMaShii Combo theme. Just letting you know so that you can get ready to update your music library. Author M.F. CalhounPosted on August 23, 2011 August 23, 2011 Categories MC's postsTags Anything Goes!, Anything Goes! Ballad, finale song, Kamen Rider OOO, Maki Ohguro, OOO DEN-O All Rider: Let's Go Kamen Rider, ost, singleLeave a comment on Maki Ohguro to release “Anything Goes! Ballad” this October. A tokusatsu what if: What if the Kamen Rider GIRLS’ Music video for Let’s Go Rider Kick 2011 had been done differently? Just one word can describe this: SUBARASHI! Video credits to 333rokoroko. Lovingly stolen from an article on Orends: Range. Author M.F. CalhounPosted on July 18, 2011 July 18, 2011 Categories Who Knows, Who Cares?Tags fan-made, Kamen Rider DEN-O, Kamen Rider GIRLS, Kamen Rider OOO, Let's Go Kamen Rider!, Let's Go Rider Kick 2011, music vidoe, OOO DEN-O All Rider: Let's Go Kamen Rider, Orends: Range, singleLeave a comment on A tokusatsu what if: What if the Kamen Rider GIRLS’ Music video for Let’s Go Rider Kick 2011 had been done differently? Kamen Rider GIRLS’ Kamen Rider V3 Cover art revealed. Aside from this, the Kamen Rider GIRLS will also be singing covers to other popular Rider theme songs. The single drops August 8th, and will be available in CD Only and CD+DVD Editions. The DVD includes the music video for the single, which stars the GIRLS, V3 himself, and professional wrestler and avid Kamen Rider fan Hiroshi Tanahashi. Author M.F. CalhounPosted on July 11, 2011 July 11, 2011 Categories MC's postsTags cover art, Kamen Rider GIRLS, Kamen Rider V3, singleLeave a comment on Kamen Rider GIRLS’ Kamen Rider V3 Cover art revealed. It started out pretty well, very good build-up, and then they started to sing…. I’ll let you be the judge. This latest single comes out August 8th, along with a new album where they cover other famous Kamen Rider theme songs. Okay, let’s see if we can get through this without gagging. The Kamen Rider pop idol group, Kamen Rider GIRLS has announced the release of their newest single, and as a “special bonus”, the wrestler and self-proclaimed Kamen Rider fan Hiroshi Takahashi will appear in the music video along with Kamen Rider V3. MY sincerest condolences to Kamen Rider V3. The new single will be a rock cover of the classic theme song, “Tatakae! Kamen Rider V3”, originally performed by Miyauchi Hiroshi, who played Kamen Rider V3/Kazami Shiro. In the video, Takahashi will fight alongside Kamen Rider V3 and the GIRLS against Destron. The shoot took place yesterday (June 17th), and Takahashi expressed how much of a dream come true it was for him to star in the video and fight alongside Kamen Rider V3. Aside from this single, the Kamen Rider GIRLS will make covers for other Rider theme songs, which they will release in an album due out in a Cd and CD+DVD (with free poster) release on August 8th. I’ll admit that their first single, the cover of the original Kamen Rider theme, wasn’t half bad. But this just seems like a disaster waiting to happen. Henshin Head Create a free website or blog at WordPress.com.